The Tracking Donations Form is free and available for your church or organization to use with immediate access 24 hours a day 7 days a week. This donation tracking template can easily help track charitable donations of the donors and the goals set for the fundraiser or special cause. These type of forms can help your next fundraiser or special cause to go much more smoothly and make your experience a lot more pleasant. The second tracking donations form is a simple form with the donor's name, contact information, gift amount and date paid. 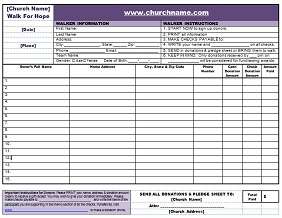 These forms can be a very useful tool to track the donations for the fundraising goals for each cause. This allows you to send the generous donors a Donation Receipt along with a very sincere thank you. Without donation forms like these below your fundraiser for your special cause may not be as successful as you would like due to the lack of organization and planning. As with any organizational or church event, you have to plan ahead to ensure that your event goes smoothly and will in turn will bring in a lot more monies for your special cause and ensure people will return to your next fundraiser. Return to Donation Receipts from Donation Tracking Form.